Software: Cappy Screen Capture - Capture Screen & Make into a PowerPoint Slide or save as BMP, JPG, GIF. Cappy Screen Capture Program can capture anything on screen and pop it right into PowerPoint, Word, or Excel. Save as file (BMP, JPG, GIF), Send as email attachment, Print, Copy to clipboard, Open in any image editor or Microsoft Paint. Capture a rectangle, ellipse, circle, square, rounded rectangle, entire screen, window contents, ROTATE TO ANY ANGLE, mirror, flip, scale, blend edges, invert colors, make black+white, adjust brightness, date stamp. Place your name + date on PowerPoint slide, Word Doc, Excel Spreadsheet. Use built-in or custom background patterns. Cappy can capture any image you can get up on the screen. It does not matter which program is displaying the image. Cappy appears as a small blue computer icon in the tray on the lower right of your screen. 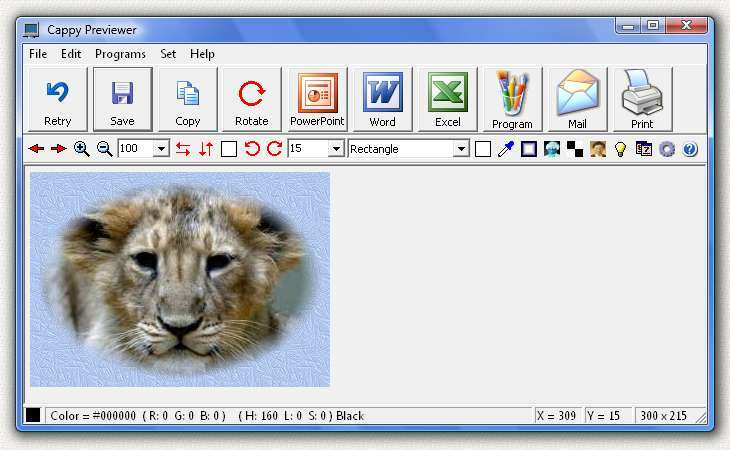 To send the image to PowerPoint, Word, or Excel, you must have these programs installed on your computer. Cappy will automatically create a PowerPoint Slide, or a Word Document, or an Excel Spreadsheet. It will then open the program and show you the captured image. You can then do any of the functions contained in PowerPoint, Word, or Excel. For example, you can add arrows pointing out features in the captured image, or add titles or labels. You can also make more than one capture and they will all be placed in the same document. In PowerPoint each screen capture will appear on a different slide, so you can capture an entire slide show. Cappy is just $5 (Five Dollars). The program works fine even if you do not pay for it. There is no time limit. It will run forever. It is fully functional. No features have been removed. It contains no spyware, no advertising. The shareware version places the word "Cappy" on the bottom left of each captured screen. If you purchase the program I will send you a serial number that will remove this line, remove the nag screen that is displayed when the program exits, and automatically place your name on the PowerPoint slide, Word Document, or Excel Spreadsheet.